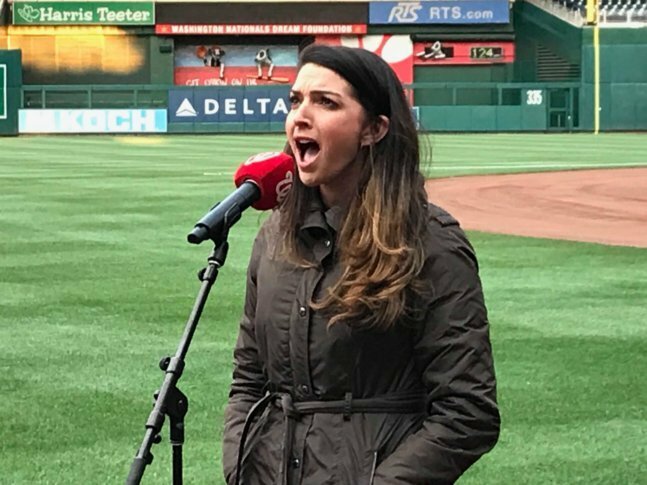 Each was asked to step up to a microphone inside Nationals Park, and sing “The Star-Spangled Banner” a cappella as their voice echoed around the ballpark. A few people chose to play the anthem on a musical instrument. Among those trying out was Lisa Johnson of D.C., whose stage name is Lisa J. She said “The Star-Spangled Banner” is difficult for many singers. “It takes you from one of your lowest notes of comfort to your highest notes of comfort in your range. And so because of that, in order to keep your tone on point for the entire song, I think that’s challenging,” she said. How does she think her audition went? “Okay. I think I could have done better on my pacing. The mic was new to me, so the echo was a little … different to get used to,” Johnson said. Patrick Mason of Annapolis, Maryland was also trying out. He has been performing anthems for about 25 years at venues large and small. Two judges with clipboards looked on as each performer or group took their turn. One of them was Nationals’ entertainment director Tom Davis, who said the open auditions are fun. “Anybody is allowed to come in and see if they’ve got the chops to give it a whirl,” he said. Davis said they want to hear performers hit all the right notes, but also keep the anthem as traditional as possible. Those who auditioned Monday will learn Friday whether they’ve been chosen to perform at a Nats home game. The team is also accepting audio or video demos from anthem performer hopefuls until May 15 at anthem@nationals.com.